Don't be afraid to come along to your first class. There is no right or wrong, just sweat and have FUN! ZFit Factorie is home to the most current and innovative Dance Fitness programs in Australia, such as Zumba Fitness and Jungle Body. Owner and head instructor, Karli Yani, is incredibly passionate about delivering fun, easy workouts for anyone at any age or fitness level. The 'family' vibe is what we pride ourselves on at Zfit Factorie. It really is a world of its own, built on L.O.V.E and feel good energy. A place where you can go and know for sure that you'll walk out feeling on top of the world! Classes are held in Campbelltown Macarthur area, we offer FREE trial classes. and discounted class passes. Just ask! 7.30pm ZUMBA - Latin cardio dance party! I have been attending Zumbafit Factorie classes with Karli now for 10 months and I am now totally addicted to her classes going 3 to 5 times per week. Karli is a vibrant, fun and engaging instructor, her presence on stage radiates a lot of positive energy. Every one of Karlis classes are fun, high energy with a great choice of music and choreography. Exercising has never been so much fun! I love her classes, they are fantastic, so much that i have to go to As many as i can! !, they have helped me in more ways then one. Ive lost more weight and gained more confidence then ever.Its a super friendly and comfortable atmosphere , everyone makes you feel so welcome. They are so much fun you don't even realise you are doing exercise. Its like a big family party every week! YAH! 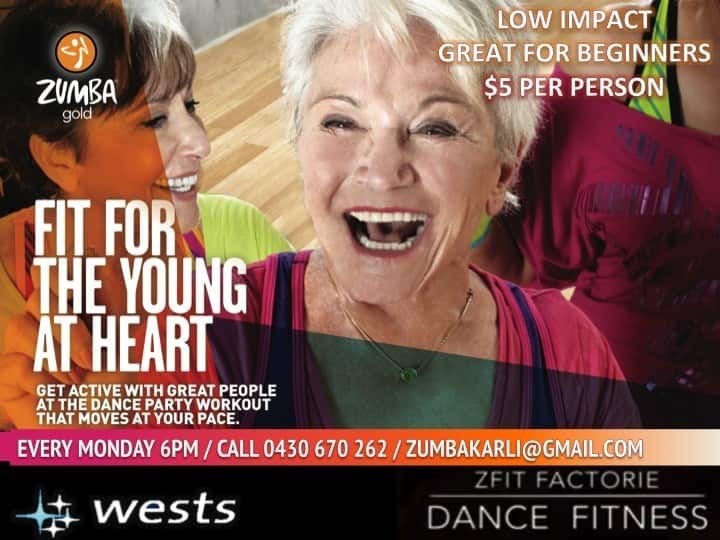 If you havent been to this ingleburn class YOU HAVE TO DO IT!! the class is pumping , Karli is unbelievabley talanted, Easy to follow and the highlight of my week!!! I go to Zumba with Karli 3 times a week, Its fantastic you don't feel like you're exercising and the hour goes so fast. Karli is very professional, easy to follow and a lot of fun, she really makes everyone feel welcome. I love it that there are a mix of ages from 8 year olds to 68 year olds who are all there to have fun and get fit its a really friendly group.